Hotcakes on the griddle, a stack of flapjacks, or just plain old pancakes—whatever you call them, these fluffy and flat breakfast treats are hard to beat. Head to one of these 10 North Dakota restaurants for an unbeatable morning meal. Avery’s AM Eatery, “always open in the A.M.”, serves up some unbelievable breakfast dishes, but their pancakes are the best! If you’re feeling adventurous, try their unique “pancake of the day.” Or order off the menu, with options of peanut butter banana, pineapple upside down (pan)cake, chocolate peanut butter, cinnamon roll, or classic blueberry. If you’re still feeling hungry, make sure to try a bite of some of Avery’s other breakfast combinations including morning cocktails, breakfast burritos, biscuits & gravy, eggs, oatmeal, build-your-own sandwich, and much more. Avery’s AM Eatery in Bismarck is the place to chow down on a stack of pancakes, whether winding down after a long night (and morning) of partying or getting energy for a long day of work! A Cajun restaurant may not seem like the ideal place for delicious pancakes, but North Dakota is full of tasty surprises! On a menu with gumbo, alligator po’boy, and crawfish, lists some of the best pancakes in the state with options of buttermilk pancakes, sweet potato pancakes, or boudin stuffed pancakes with either sweet potato or buttermilk. These pancakes are huge so you’d better bring a big appetite. Make sure to top sweet potato pancakes with their signature sugar cane syrup to complement their unique taste. You’ve never known you’d crave Cajun pancakes, but you’ll never want to stop after taking your first bite at Fargo’s Cajun Cafe. Family owned and operated CJ’s Kitchen serves up some of Fargo’s best and most authentic homemade comfort food, all made from scratch! Breakfast is served all day, so you can even have pancakes for dinner at this cozy and welcoming hometown cafe. The pancakes are just fluffy enough and they melt in your mouth with every bite. Customers can choose from either buttermilk pancakes or fruit pancakes with blueberry, apple, or banana. Delish.com even crowned this diner as having the best pancakes in the state! Darcy’s Cafe in Grand Forks is a classic Americana diner with friendly waiters and waitresses and a cozy, welcoming atmosphere that draws in loyal customers. 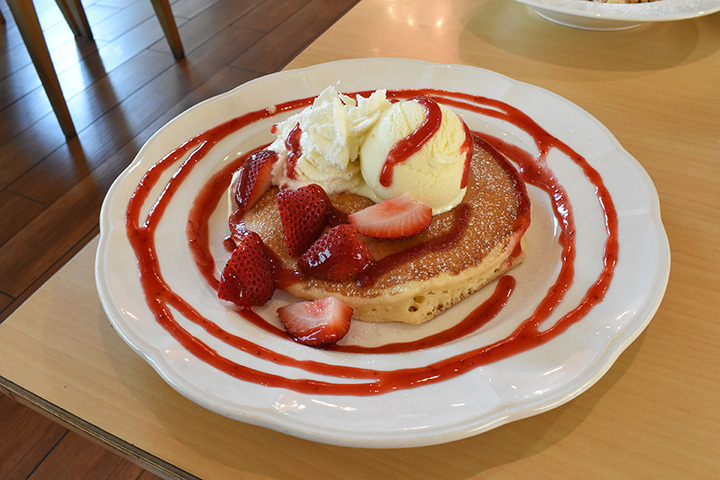 While the menu has plenty of delicious options, one of their best menu items is their mouth-watering pancakes. Diners can choose from a variety of pancakes like buttermilk pancakes with the option of adding blueberries or chocolate chips, cinnamon roll pancakes, pumpkin pancakes, or “great pumpkin pancakes” made with chocolate chips and pecans. Before a long day of hiking in beautiful Theodore Roosevelt National Park, fuel up by eating a huge stack of pancakes at Theodore’s Dining Room in small-town Medora. Customers rave about the restaurant’s unbeatable lemon ricotta pancakes. These creative hotcakes are as tasty as they sound and are a welcome change from traditional buttermilk pancakes. The Depot Cafe is a local gem in Jamestown! At this restaurant, breakfast is served all day so come here for pancakes all day! The menu has several pancake options like the small pancake platter (three small pancakes served with one egg, two slices of bacon, two sausage links or a sausage patty), strawberry pancakes (two medium pancakes topped with strawberry topping and whipped cream), or medium pancake platter (served with two slices of bacon). Dickinson’s Country Rose Cafe is the expert in breakfast food. Whether ordering eggs or bacon or pastries, you’ll never be disappointed, but the menu’s crown jewel is their pancakes! They are cooked perfectly every time so even the harshest pancake aficionados will always leave with a smile and a full belly. If you’ll be in Dickinson for lunch, make sure to stop by again to try some items from their tasty lunch menu as well! For hungry truckers, Jamestown Truck Plaza is a paradise. This friendly, hometown cafe serves up breakfast dishes big enough to feed the army, including their huge and filling pancakes. These hotcakes are so big that they completely cover the plate, with each bite as delicious as the last! The tiny town of Belfield hides a hidden gem for pancake lovers—the Trapper’s Kettle Restaurant. This small cafe serves some big meals to satisfied loyal customers. The menu offers buttermilk pancakes or blueberry pancakes, so you can’t go wrong! This 1950s-style diner is perfect for satisfying that pancakes craving. Kroll’s Diner prides themselves on their special pancake recipe. A favorite is the Pigs in a Blanket, which are four link sausages wrapped inside two pancakes. Yum!